As kids, introverts are labeled as shy. They need to speak up more in class (how much did I hate hearing that?) And I always had a little anxiety mixed in with the introversion, which did not help my social standing in schools. The first incident I remember came from either kindergarten or first grade. My mom had given me a envelope of money to turn into the teacher. I'm not sure what it was for, but I remember it consisted of a lot of change. Possibly a fee of some sort. I waited for the teacher to ask us to turn in the money, but she never did. Just like that, my window of opportunity slammed shut. There was no way I was voluntarily asking the teacher where to put the money so I kept the money to myself. This probably would've been fine if it wasn't parachute day in gym. 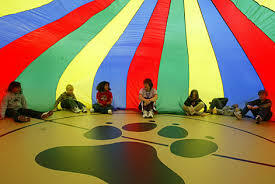 Does anyone remember parachute day??? It was the best. I'm not even sure why. I just know it was magic when that parachute would fly above our our heads and we would duck under. Like a giant kid filled apple turnover. I can no longer remember how it happened, but it was during the time where we all were holding the parachute. The envelope just burst open and change flew from my pocket and landed on the parachute. Silver and copper coins jumped and bounced on the parachute as we flapped it up and down. The teacher was flabbergasted. Where did the money come from? But I wouldn't...couldn't...say. I kept my mouth shut. I'm sure the rest of the my classmates were confused too. Maybe they still remember the day the parachute started crapping out money! After that, it's a blur. I'm pretty sure I eventually got in trouble because the teacher told my mom I didn't turn in my money and my mom swore she gave it to me. But that part was less important and less embarrassing. The memory that sticks out is the anxiety I felt knowing I needed to turn that money in. Then realizing I was the one that made money fly on that parachute. Knowing I would never say a word. At least it didn't ruin my love of the parachute. But it was just the beginning of a long line of stupid decisions ruled by anxiety that followed me throughout my life and all my jobs. There are more incidents. There always are... Stay tuned.